There have been some big passing games from Colin Kaepernick in his short career but he is still known for his running abilities and not his throwing, with interceptions against good defenses usually ruining his reputation. With an improved wide receivers situation, the San Francisco 49ers believe their quarterback can finally break out as a passer and leave the critics looking for answers. Although passing yards isn’t the most telling of numbers, 19 other quarterbacks threw for more passing yards than Kaepernick did in 2013. He had an amazing start to the season with 412 yards against the Pacers, but that was followed by throwing over 200 yards only once in the next nine games, as the 49ers lost four times. His interceptions (twice) in the Conference championship game against the Seahawks didn’t help him quiet the noise around him, despite running for 130 yards. Except for his usual performances against the Packers in both the regular and post season, Kaepernick didn’t have a single big, or really big game during last season; you expect a bit more from a quarterback with such a huge hype surrounding him. Things did look better for him when Michael Crabtree came back from injury, and this season he’ll have him right from the start. 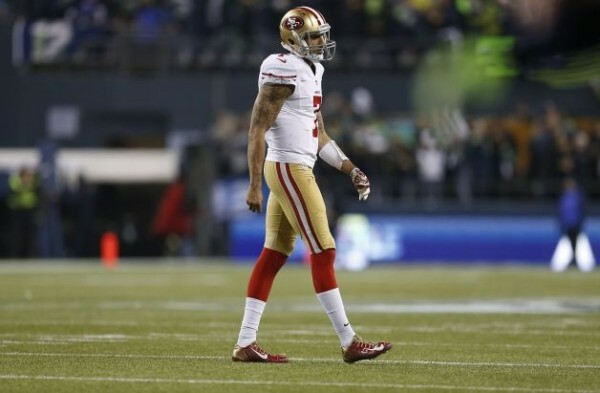 Vernon Davis is giving the Niners problems with his contract, but Kaepernick doesn’t like throwing to him anyway. Anquan Boldin remains and so does Quinton Patton who should take a step forward this season. The additions of Steve Johnson, Bruce Ellington and Brandon Lloyd (if he makes the team) should make things easier for Kaepernick. Jim Harbaugh, his head coach, obviously thinks that a break out is just a matter of time: I really expect a real breakout year for Colin. Athletically, he looks bionic. If you all remember ‘The Six Million Dollar Man’? That’s what it looks like to me. Kap said it the other day – he feels like he has a stable of receivers now. And maybe that’s the first time that we’ve said that since we’ve all been here together. And I concur. It feels that way. The Niners are necessarily a pass-first team. They love to run the ball through that huge offensive line they have, so we might never see Kaepernick become a throwing machine, at least not in this incarnation of the team, just like Tom Brady took some time before he became one of the best passers in NFL history. As long as Kaepernick does enough for the team to win, it shouldn’t matter if he throws for 150 yards or 350. Winning a Super Bowl, with the window for that still open, is all that matters.